I was just at Lithia Park taking a walk along the creek around 10:30 am. Stopped at BlueBird Park and saw nothing. Walked to Bridge #3 and saw one dipper on a rock below the bridge. It soon flew upstream. I then walked back to Bluebird Park, now 11:00 and saw a dipper fly into the nest box. It stayed in there for over 5 minutes. I got a very shadowing photo. 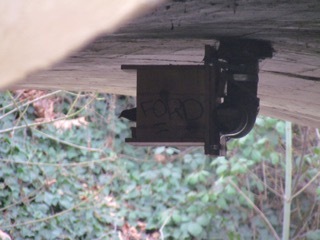 It then hopped around a bit under the bridge and I saw that it was banded. It’s right leg looked like Red/Silver and left leg White/White. After awhile it flew upstream. Kathy photo show the bird on a nest box that was placed under the bridge in 2013 with the hopes it would provide an upscale accommodation compared to the small drainpipe that has been used. It will be interesting to see which nest site is utilized.